Understanding relative humidity is essential for the safety of your home. A humidifier is a great appliance for comfortable living, but you need to know how to safely operate it. Dry air can damage your body and household items, moist air is also a problem. In climates where moist air is a problem, dehumidifiers have been introduced. What relative humidity level should you use? The rule of thumb is 30-50%. Your humidifier may come with some sort of humidity meter. If you cannot find one specifically for your model of humidifier, check out your local hardware store for a hygrometer. During winter, when the heat is on, the relative humidity in your house can become very low. This is because heated air can hold much more moisture than cold air. So, as the air in your home heats up, it becomes “thirsty” and begins sucking moisture out of surrounding surfaces: plants, walls, furniture, books, paintings, human bodies, everything. Whenever we heat air we dry out the air to uncomfortable and damaging levels. Mites aren’t the only unwelcome guests that can infest your home. Fungi and mold become prevalent when the relative humidity of a home reaches 75%. Fungi and molds can cause asthma attacks and rhinitis (inflammation of mucous membranes of the nose) in some people. You should also reduce setting if moisture forms on windows, walls etc, or if there is dampness around the area of your humidifier. Keep in mind that you don’t need to be concerned it this temporarily happens due to cooking, showering, etc. If you get nothing more out of this article, make sure to remember that the humidity levels of your house need to be within the 30-50% humidity bracket. Regulate your humidity with your humidifier’s built in humidity meter or by a hygrometer from any good hardware store. Sealing doors and windows, and fireplaces that are not in use. Use tape or special window and door sealers. Do not keep your humidifier in a confined space, get the most out of your humidifier by making sure it is not being restricted by it’s surroundings. NB: Do not humidify over 50%, also reduce setting if moisture forms on windows, walls etc, or if there is dampness around the area of the humidifier. Recommended humidity levels are between 30-50%, this will vary on your personal comfort and the type of humidifier you own. Read understanding humidity for more information of recommended humidity levels. Humidifiers come in all shapes and sizes, from hatbox-sized portable units to furniture-sized consoles. But they all do the same thing: They put moisture in the air. And they do it in one of five ways. Evaporation: Evaporative units have a fan inside them that blows air through a wet pad, and this moisture-laden air then continues on into the room. (“Wicking” humidifiers do the same thing, only the air is blown through a moisturized filter instead of a pad.) Evaporative units don’t produce a spray and are therefore less likely to spread germs than are units that throw a cool mist into the air. The wet pads however, can become a breeding ground for bacteria if not cleaned regularly. Steam:These units, sometimes called vaporizers, boil water and send it into the air as steam. They tend not to put microorganisms into the air; after all, it would take an extraordinarily tough germ to survive the boiling process. Unlike other kinds of humidifiers, they produce little or no “white dust.” Steam units leave the minerals behind when they boil water in their tanks. Warm mist:These units boil water just like steam vaporizers, only the steam is cooled slightly before exiting the unit, resulting in a “mist” of warm water droplets instead of real steam. Cool mist:These units break up water into tiny droplets and spray a cool mist into the air. Because the water isn’t boiled, the cool vapor may contain potentially harmful organisms if the tank is not properly cleaned and sanitized. Ultrasonic:These units use high-frequency vibrations to break up water droplets into an extremely fine mist. The mist produced by these machines contains no molds and comparatively few live bacteria. It is thought that the ultrasonic vibrations may “break up” and shatter living organisms along with the water droplets. However, while these bits of dead microbes may not cause respiratory infections, they may still trigger allergic reactions in sensitive people. A comparison of specifications for more humidifier models. Note A = Separate installation kit available and may be purchased separately. (top to bottom) also unit does not give 100% block off for air conditioning. Aprilaire 400 Fiberglass 1 feeder compartment Easy remove front cover Est. 13.0 ? What is our filter reminder? This is a free, absolutely no obligation reminder service. Just fill in your email below, and the expected duration of your filter life, and we’ll send you an email when it’s time to change it. Simple as that! And don’t worry, you won’t be pestered in any way, you’ll only receive a short email at the specified reminder date. * We do not send out advertising material ever! Disclaimer: Manufacturer’s guidelines should be your first source of information, some maintenance issues may be model specific. To reduce build up of scale, film, rust, and white humidifier dust, use water with a low mineral content or use a demineralization cartridge or filter. Bacteria often grows in humidifiers which are equipped with tanks containing standing water, this is why it is important to replace the water regularly. Follow manufacturer instructions for cleaning chemical usage. Make sure to thoroughly rinse out the cleaning chemicals with water before use. Thoroughly clean and dry your humidifier at the start and end of the season. Use humidifier cleaner and antibacterial solution to prevent and eliminate the build up of minerals, bacteria, etc. Note – We recommend that you clean the reservoir regularly during the heating season if the bacteria-control product you use allows it. Your humidifier can be taken apart for cleaning – please check your owner’s manual to learn the best technique for your unit. You may have a problem with the float assembly getting stuck after the disuse of summer. To prevent this, clean the float assembly with vinegar or one of our humidifier cleaners when the heating season is over. Do not overextend the life of your filters, be sure to replace them when needed. Be sure to unplug the humidifier before cleaning and maintenance. Daily replace the remaining water from your tank with fresh water, and wipe down the entire humidifier surface. Try to clean out the humidifier tank with a brush if possible. Clean portable humidifiers every third day or so. Remove scale, deposits, or film that has formed on the sides of the tank or on interior surfaces, and wipe all surfaces dry. How regularly you need to clean your humidifier will depend on the mineral content of your water and whether a demineralization cartridge or filter is used. If using a furnace mount humidifier, do not leave water in the tank for extended periods of time, make sure to follow the manufacturer’s instructions that came with your humidifier and clean regularly. A system of belts and pulleys is employed to transmit power from the motor to rotate the evaporator drum. This series of pulleys decreases the motor RPM to a slower pace for the evaporator drum. The pulley system requires no maintenance. 1. Unplug the humidifier from the power outlet. 3. 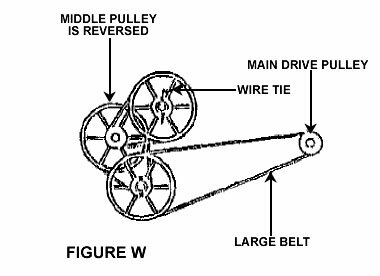 The belt and pulley system now exposed consists of a main drive pulley on the rear motor shaft turning a large belt to three other pulleys (which are identical) which are turned by two small belts. A wire unites the top pulley to the drive roller shaft which rotates the evaporator drum (Fig W). 4. The tie wire can be straightened to allow it to be removed. After the wire tie is removed, all pulleys can be slid off their shafts to replace them or the belts. 5. Occasionally a belt will stretch and lose enough grip to not turn the evaporator drum. A stretched belt should be replaced. Never stretch a new belt when assembling on the humidifier. 6. With required parts replaced, re-install belts and pulleys according to Figure W. Notice the middle pulley is installed reverse of the other two pulleys. 7. Reverse steps 2 and 1 to re-assemble the humidifier.